Chock Full of Beans is another famous hipster branch cafe located at the far reaches of Singapore, in Changi Village. As a weekend branch place, we consider Chock Full of Beans to be in the top 3 of the best brunch cafes in Singapore. HungryGoWhere agrees, with the place having a rating of 98% over 50+ votes. What’s so special about Chock Full of Beans? Well, their expert baristas are able to create the most amazing 3D latte art, and they have the most incredible poached eggs that you will ever see. No complaints about the service here, the standards are high. 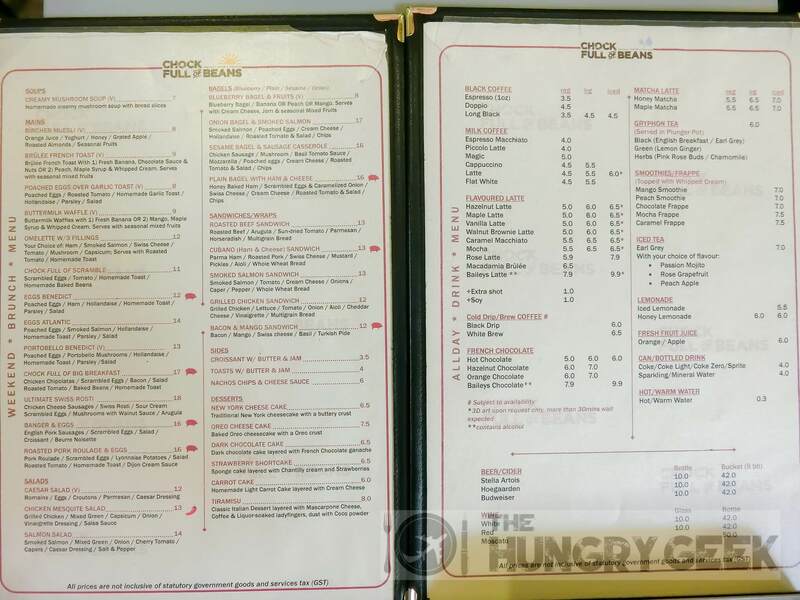 As for the menu, everything is clearly laid out with the food recommendations marked with a red pig logo. You can only get their 3D latte art with some of their iced drinks, and these are marked with an asterisk(*). Expect a long wait for the 3D latte art during peak hours (>30 minutes). At Chock Full of Beans, you really won’t go wrong with their eggs. They have the most amazing poached eggs that I have ever seen, and their scrambled eggs are one of the best that you will find in Singapore. They do not accept reservations for weekend brunches, but for our recent visits, we did not have a problem getting a seat here. The 3D latte art is really amazing. Its a great photo opportunity for the Instagram-lovers and we must really commend the skill of the baristas here. As for the Iced Hazelnut Latte, we found the hazelnut taste strong and fragrant, making it a very good choice for people just starting on coffee, or those that don’t really like coffee. It wasn’t too sweet either. We give this drink a 3.9 with an additional 0.2 for the amazing 3D latte art for a rating of 4.1/5. Eggs Atlantic is Sheryn’s favourite choice when it is available at a cafe, so we had to try it. For those that aren’t really fans of salmon, do go for the Eggs Benedict instead which replaces the salmon with ham. The amazing part of this dish is their poached eggs. Unlike most other places with too runny or overcooked egg yolks in their poached eggs, here at Chock Full of Beans they managed to prepare their poached eggs with the perfect timing such that it remains runny and fluid, but it doesn’t ooze out of the egg yolk when sliced or breached! For the lack of a better phrase, we shall call these the first ‘al dente‘ poached eggs that we have seen. Simply amazing, and the poached eggs deserve a 4.5/5. The poached eggs go really well with the creamy hollandaise, the salmon and their homemade toast. Eat a layer of it and you will experience that shiok feeling. The salmon was flavourful with just the right amount of salt. However, we wish that the toast was crispier on the inside with a softer outer skin. Eggs Atlantic as a whole gets a super delicious 4.3/5. You can get it for S$14. Okay so we customised this to remove the baked beans, salad and tomatoes, but it still looks great. The scrambled eggs here is probably one of the best in Singapore, with a superb texture and flavourful taste. You can tell that they mastered the balance of butter, milk and seasonings here with these scrambled eggs. Take a forkful and you get the shiok feeling again. We preferred them with a generous amount of pepper added. We rate their scrambled eggs 4.4/5. As for the rest of the items, well, they were solid but not too exceptional. The chipolatas were well done but the bacon didn’t have the perfect crispiness and the toast had the same softness issues as the one that came with the Eggs Atlantic. The dish as a whole gets 4/5, and costs S$17. We’ve always been constantly disappointed with our brunch experiences at cafes in Singapore. They are usually ridiculously expensive and the food is disappointingly mediocre. Chock Full of Beans is one of the few cafes to buck this trend, and if you are a fan of weekend branches at hipster cafes, Chock Full of Beans is a must try. This is amongst the top 3 best brunch cafes in Singapore. They have the best poached eggs that we have seen, and their scrambled eggs are very well done as well. Don’t forget to order their 3D latte art with your iced drink. The location is a bit out of the way, but as of late we’ve seen gentrification of Changi Village with an increasing number of cafes opening along the same row of shops. It is just next to the seaside and Changi Point Coastal Walk, which is one of the most gorgeous park walks in the whole of Singapore, especially in the evening and night. If you drive, there is one of Singapore’s first mechanised public carparks to use, but with the reported teething issues you should park at the Blk 5 open-air carpark instead.